Cleaning a cartridge pool filter can be a bit tricky if you have never done it before. Every pool is different, so check to be sure your filter adheres to the advice below before proceeding. Cartridge pool filters are commonly found on above ground swimming pools, and this type of pool is very appealing to families who cannot afford the money, space or time that comes with an in-ground pool. Above ground pools are also great for those who do not want the permanancy of a traditional pool. If you have an above ground pool in your yard, chances are you've encountered the tricky process of cleaning a cartridge pool filter. However, it doesn't have to be difficult. Be sure you purchase quality cartridge filters. Don't automatically go for the cheapest brand, especially if it is one you have never heard of before. Saving a small amount of money will not be worth the unsanitary conditions that may crop up if your filter fails. To ensure you are purchasing a quality filter, look for one made out of pleated fiberglass or synthetic materials. Stay away from paper, as it is very difficult to clean. Run your system as normal. When you notice it becoming dirty, take it out of the pump-filter assembly. Use a garden hose to rinse away any loose dirt, scum, or any other debris that can hinder proper cleaning. Do not wait for the filter to dry - it rinses clean much easier when damp. After you have rinsed the filter, you can allow it to dry in direct sunlight. Putting it directly under the sun will keep bacteria from growing. Use an air compressor to blow off any particles. Fill a large bucket with one part pool chlorine with 6 parts water. Douse the filters in the solution and cap the bucket with an airtight lid. Most large buckets will hold 5 or more filters, so there is no need to wash them one at a time. Instead, store them up for efficient cleaning. The soaking solution will then kill off any bacteria or microorganisms that are trapped inside the filter. Leave soaking in the solution for at least a day, preferably up to 5 days. Rinse the filters in a bucket of clean water, agitating them in and out of the water. You'll see the contaminents escape from the filter. Hang your filters out to dry in direct sunlight and make sure they are completely dry. Finally, mix a solution that is one part muriatic acid and teb parts water. Soak the filters in the acid and wait until the bubbling stops. This means all mineral deposits are dissolved and ready to be removed. 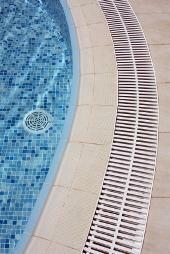 Rinse the filters thoroughly and reinstall into your pool when ready. You can reuse most of your pool filters repeatedly until they start to show wear and tear. Remember that you are dealing with organic matter that can be distressing to eyes and lungs. Keep yourself away from breathing in the dust directly, either by wearing a mask and gloves, or using compressed air to blow away rogue articles. Chlorinizer and acid are very strong and can cause harm. Be careful not to spill or splash, and always restrict the access from children. You can keep your buckets of chlorinizer and acid sealed tightly for reuse. Once the formulation is mixed, you can use it several times as long as it is stored tightly and safely enough to preserve the effectiveness of the chemicals. Remember to add chemicals to the water, rather than water to the chemicals. This is both safer and more effective.